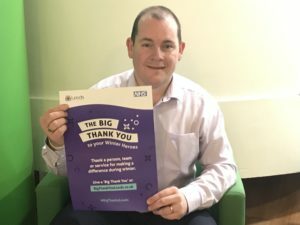 The citywide Big Thank You campaign encourages people to say a thank you to anyone who they see as a winter hero – from an individual through to a community group or a service. People are also encouraged to sign up to be winter heroes, taking small steps that can improve their, or their loved ones, health as well as looking out for vulnerable community members. Chris Pointon (pictured left), Co-founder of #HelloMyNameIs, said: “The idea of the Big Thank You campaign is great, it’s about thanking those winter heroes who are compassionate towards others and go above and beyond for people during winter. The ‘Hello my name is…’ campaign set up by my late wife Kate Granger, is all about compassion and I’m really pleased to lend my support to get people to say thank you. “You can thank anyone for this or previous winters, this could be a friend, family member, work colleague or your neighbour. It could be someone who may have done a small act of kindness that made a huge difference to yourself, or someone you know during the winter period. People will be able to post their thank you message on the Big Thank You website (www.bigthankyouleeds.co.uk), it’s really easy to do and shouldn’t take no more than a few minutes. Dr Jason Broch, Assistant Clinical Chair, NHS Leeds Clinical Commissioning Group, said: “Having Chris on board for the Big Thank You campaign is fantastic. With Chris’s support we’re hoping that it will encourage other people in Leeds to thank their winter heroes. “Sharing your thank you message will only take five minutes or less by visiting the website (www.bigthankyouleeds.co.uk), you can then share your message on Facebook or Twitter. We’ve had over 500 thank you messages from people across the city as well as people from outside of the city. The ‘Hello my name is’….. campaign is focused on reminding healthcare staff to introduce themselves to patients properly as it advocates that a confident introduction is the first step to providing compassionate care and is often all it takes to put patients at ease and make them feel relaxed whilst using our services. The campaign was set up and driven by Dr Kate Granger, a doctor who had terminal cancer and experienced what it was like to be a patient; she said that one of the starkest observations on the quality of her care had been that not all staff who approached her introduced themselves to her. Kate sadly passed away on 23 July 2016, however her legacy continues through the ‘Hello my name is…’ campaign.